A quick overview of Non-Entity Superclasses. A non-entity superclass (abstract or concrete) provides only inheritance of behavior to its entity subclasses and its state is not persisted in database. 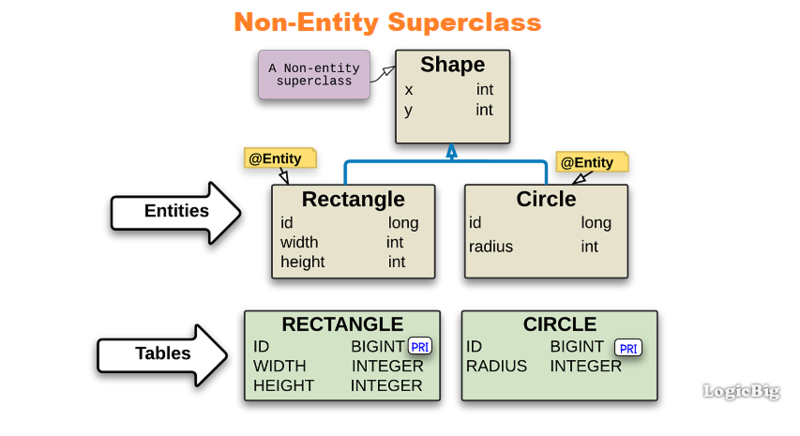 A superclass is treated as non-entity class if no mapping related annotations such as @Entity or @MappedSuperclass are used on the class level. Any mapping related annotations on fields or methods of such superclasses are ignored. As non-entity superclasses classes are not managed by JPA, they cannot be passed as arguments to methods of the EntityManager or Query, for example, we cannot use EntityManager#persist(myNonEntityClass). In above mapping, we are only interested to persist shapes without their current location (origin). On loading shapes from database, shapes will always be set to their default position.